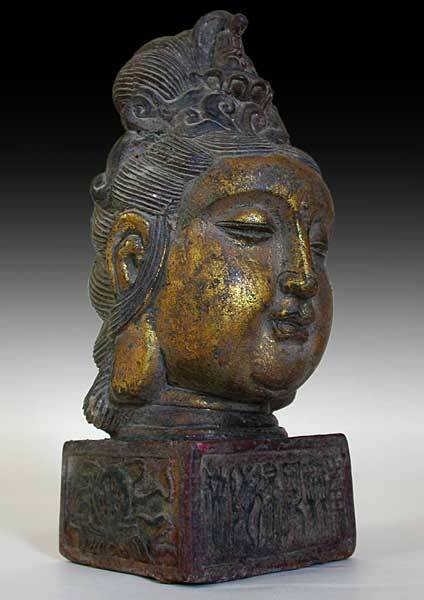 Tibetan Buddhism first began to play an important role in China at the court of Khublai Khan during the Yuen Dynasty (1271-1368). 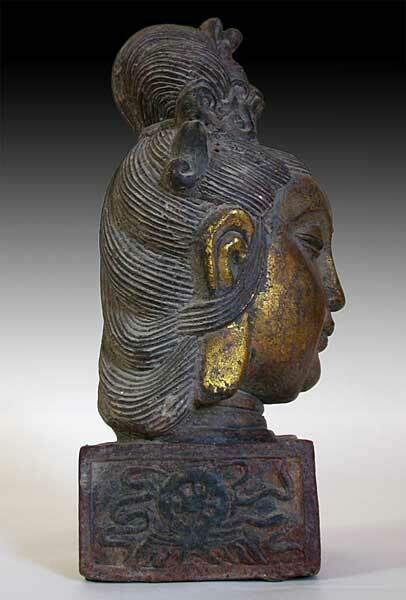 Its influence expanded in Ming of the Yongle reign (1403-1444), and finally was fully absorbed in China under the imperial patronage of Qianlong of Qing (1736-1795). 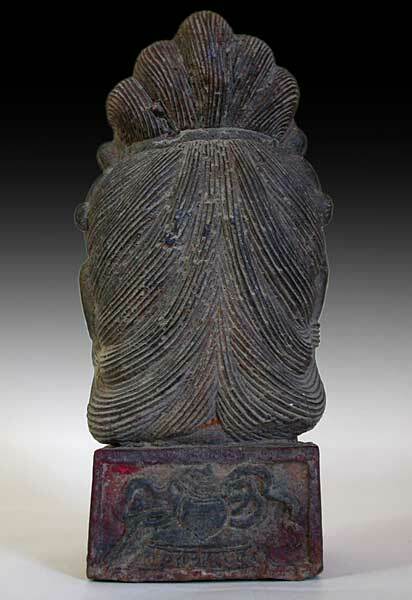 Tibetan Buddhism transformed not only China's spiritual practice, it has dramatically altered all forms of Buddhist art in China with a complex iconography system largely drawn from Nepalese sculpture. The presenting example is a cast iron head of Quan Yin Bodhisattva, whose soft features, round forehead and fuller cheek are distinctively styles preceeding the Tibetan influence in the Ming and Qing dynasties. 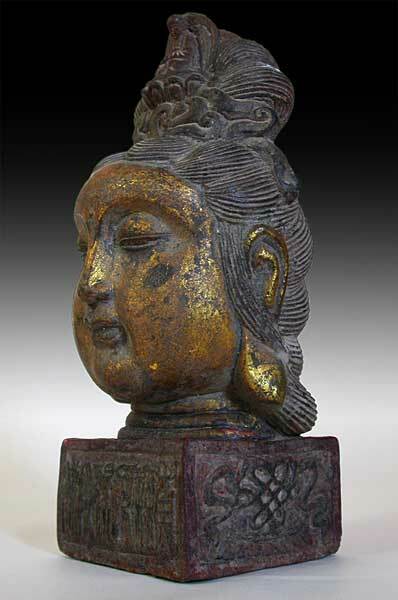 Her solidity and exuberance in fact represents one of the most important and long lasting styles in Buddhist imagery to develop in China since 7th century. 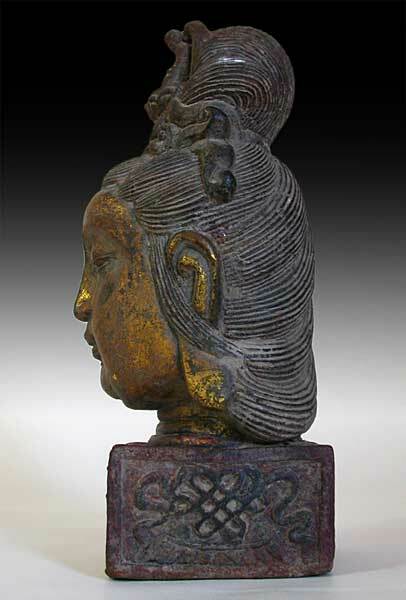 The remarkable quality of this gilt iron head of Quan Yin and its excellent preservation made dating the sculpture an uneasy task. 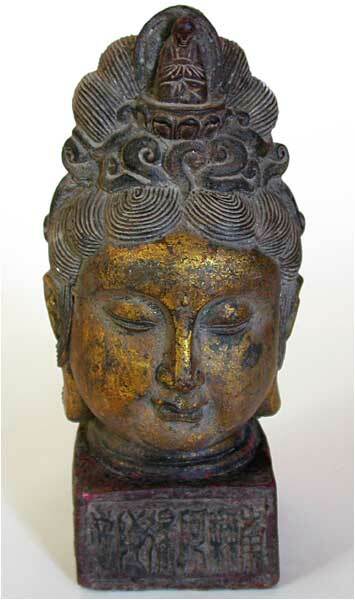 The Bodhisattva's round face, her finely forged hairlines woven in a twin swivels atop its forehead, upon which sits a well casted Buddha Amitabha, including the Tang style inscriptions on the front panel "Namah Amitabha" are undoubtedly of the Tang origin. However, the iconography of an Endless Knot on the left panel, the Buddhist Wheel of Life on the right, and on the back panel the Sacred Conch Shell on a rectangular pedestal suggested a later time. 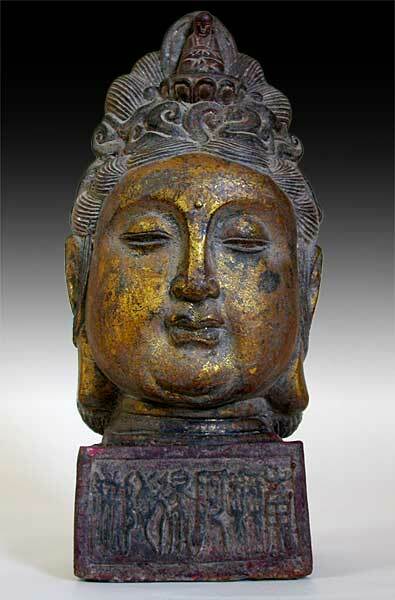 Thus we conservatively date the statue at late Ming to early Qing dynasty.